Located in the heart of South America is the world’s largest wetland that has not been significantly modified by humans, the Pantanal. The Pantanal is often referred to as South America’s biggest biodiversity star. However, it is also one of the continent’s best-kept secrets, often overshadowed by the Amazon Rainforest. This massive wetland covers an area estimated at 75,000 square miles across Bolivia, Paraguay, and (mostly) Brazil. The Pantanal is home to over 4,700 species of plants and animals. The array of life in the Pantanal relies on an annual flooding cycle. 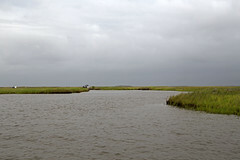 When it rains, about 80 percent of the floodplain is submerged underwater; throughout the dry season the water lessens. This process is essential to nurturing a biologically diverse collection of plants and providing nutrients that the wetlands need to flourish. An area that is the size of Belgium, Switzerland, Holland, and Portugal combined needs a lot of water to guarantee that it continues to flood and a healthy ecosystem is preserved. The quality of the water is also important to maintaining a nourishing environment. Recently, human activity has been threatening this precious wetland. The Pantanal is threatened by intensive farming, deforestation, and pollution. Few signs of this situation improving are shown, and environmental issues are difficult to resolve quickly. Conservation of the biodiversity and natural resources of the Pantanal is essential. quantities of organic substrate are being exported. Kelso Bayou to prevent additional tidal scour.